This exhibition was produced with the support of Galerie-Chateaufarine. 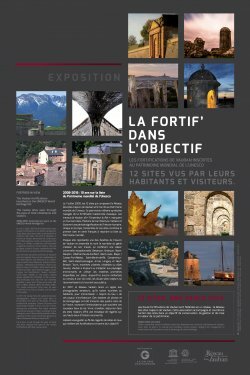 The Network of Vauban’s major sites invites you to (re)discover Vauban’s fortifications, through the traveling exhibition ‘Fortress in Focus**’. It’s your chance to see through the eyes of amateur photographers and guess what "spirit of the place" of each of these architecture treasures they have captured. From Arras to Villefranche-de-Conflent, via Mont-Dauphin, Blaye or Saint-Vaast-la-Hougue, these photos, transposed from their digital format to large format dibond panels, will bedeck the ramparts of the major Vauban sites until 2019. The photos exhibited are winners of an amateur photo contest initiated by the Vauban Network in 2017. After a pre-selection by a jury, Internet users voted for their favorite images by selecting one photo per major site. The result is the present exhibition made by the public for the public. Let yourself be guided by the vision of those who reveal and bring on to focus these fortifications !